SABA, A. Bucherer & Cie of Amriswil, Switzerland made over 160 different antique character dolls 6 to 9 1/2" tall with a patented metal ball jointed body and a composition head from 1921 to 1935. Some of the personality SABA dolls include; comic characters Katzenjammer Kids; Hans, Fritz, Mama, der Captain and der Inspector, Happy Hooligan, Max and Moritz, Mutt and Jeff. Reg'Lar Fellers; Jimmy Dugan. Animals figures; Mrs. Peter Rabbit. Celebrities figures; Charlie Chaplin, Amelia Earhart, William Hart, Buster Keaton, Harold Lloyd. Clowns; Koko, Saba. Everyday people like; a Cowboy, Policeman or Fireman. Regional Costume Characters; Becassine doll and many others. Dolls or figures are marked on the torso: Made in Switzerland Patents Applied For. Most of the dolls have the clothing sewn directly onto the doll. 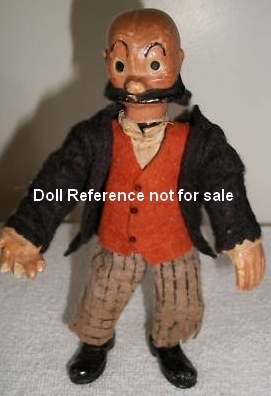 Antique Bucherer dolls are desirable and of high quality.